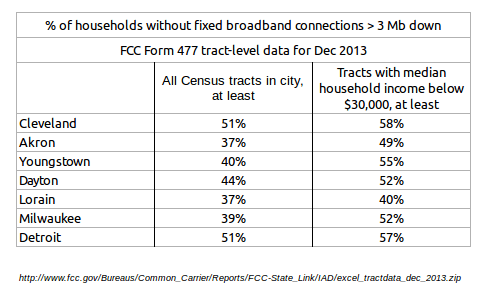 In comments filed with the Federal Communications Commission in late December, and in a letter sent to the agency on January 21, the Coalition for Broadband Equity has welcomed statements by Charter Communications and GreatLand Networks that they plan to create low-cost Internet plans for low-income households, but called them “far too vague to be taken at face value”. The coalition, composed of twenty-three organizations in eight communities slated for “divestment” to Charter and GreatLand as part of the proposed merger of Comcast and Time Warner, reiterated its position that the FCC should “require both companies to submit ‘specific, measurable, accountable plans’ to increase cable broadband use by low income households in our underserved communities… as part and parcel of any order allowing the Transactions to go forward”. The Coalition is now seeking a meeting with the FCC’s lead staff overseeing the merger case to discuss the issues and recommendations raised in the letter. The full Commission is expected to make a decision on the case in about two months.